The CJA parent group — the Parent Involvement Initiative (P.I.I.) — invites all parents and guardians to participate in whatever way they can including parent and guardian volunteer days, service as grade-level representatives and the planning of our annual Magis Day celebration. In addition, the P.I.I. meets monthly and offers workshops on a variety of topics including healthy eating and effective discipline techniques. Our school functions at higher level when our community is engaged and our parents get involved and stay involved so we also offer families regular fellowship opportunities through Community BINGO nights and a Parent Brunch. For information regarding CJA’s Parent Involvement Initiative, please contact Mrs. Charlotte Curtis or Ms. Raynesia Fleming at (773) 638-6103. 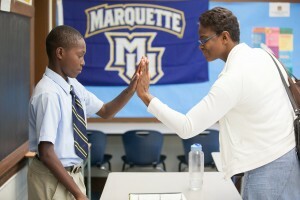 Belief Statement: Chicago Jesuit Academy is committed to providing a learning environment that supports and promotes wellness, good nutrition, and an active lifestyle and recognizes the positive relationship between good nutrition, physical activity and the capacity of the students to develop and learn. The entire school environment shall be aligned with healthy school goals to positively influence students’ beliefs and habits and promote health wellness, good nutrition and regular physical activity. In addition, school staff shall be encouraged to model healthy eating and physical activity as a valuable part of daily life. Intent: The purpose of this policy is to ensure a total school environment that promotes and supports student health and wellness, helps to reduce childhood obesity and meets the requirements of the Child Nutrition and WIC Reauthorization Act, including goals for nutrition education, physical activity and other school based activities designed to promote students’ wellness. Rationale: The link between nutrition and learning is well documented. Healthy eating patterns are essential for students to achieve their full academic potential, full physical and mental growth and lifelong health and well-being. Healthy eating is demonstrably linked to reduced risk of the development of many chronic diseases. Schools and school communities have a responsibility to help students acquire the knowledge and skills necessary to establish and maintain lifelong healthy eating patterns. Well-planned and well-implemented wellness programs have been shown to positively influence children’s health. Schools also have a responsibility to help students establish and maintain lifelong habits of being physically active. According to the U.S. Surgeon General, regular physical activity is one of the most important things people can do to maintain and improve their physical health, mental health, and overall well-being. Regular physical activity reduces the risk of premature death in general and of heart disease, high blood pressure, colon cancer, and diabetes. Chicago Jesuit Academy will comply with the goals of the Student Wellness established by the Archdiocese of Chicago, Office of Catholic Schools.